A 1965 Aston Martin DB5 Convertible sold for $1.45-million as the top result at the Bonhams Greenwich Concourse d’Elegance sale in Connecticut, USA. The top result at the Bonhams Greenwich Concourse d’Elegance classic car auction in June 2018 was $1,450,000 paid for a 1965 Aston Martin DB5 Convertible. A highly original, unrestored 1959 Mercedes-Benz 300 SL Roadster sold for $895,000. The sale included several cars owned by Carroll Shelby that set auction record prices but unfortunately did not include any original Cobras. 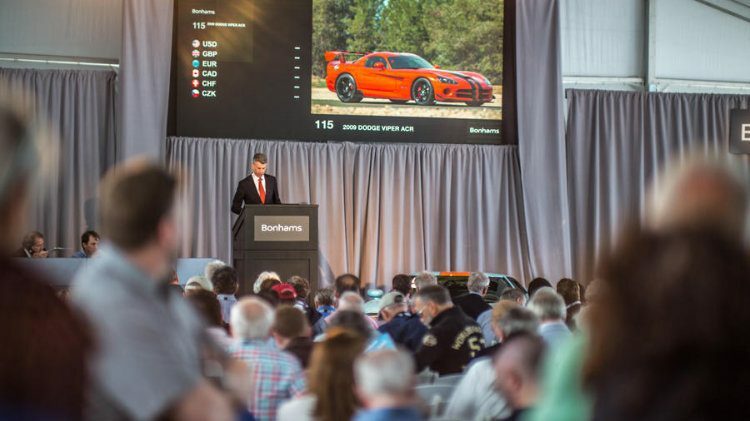 Bonhams‘ 11th annual Greenwich Concours d’Elegance Auction was held on 3 June 2018 on the waterfront of Greenwich, Connecticut. Around 125 cars representing every era of motoring over the last century were on offer. The sale realized more than $10.5-million with a very impressive 92% sell-through rate. A highlight of the auction was a collection of cars owned by Carroll Shelby but unfortunately no original Cobras. 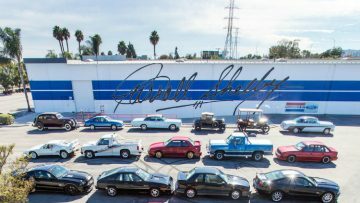 Bidding on the Carroll Shelby Collection was electric with a packed auction tent and bids coming in from four continents via phones, internet and on-site bidders. All estimates were blown away resulting in a 100% sell-through rate for the collection and multiple auction records set for numerous models, including the 1999 Shelby Series I that made $313,000, the 1965 Shelby 427 Continuation Cobra that sold for $259,840, the engine-less 1987 DeTomaso Pantera GT5-S that achieved $226,240 and the 1966 Ford Mustang Shelby GT 350 Continuation Convertible that was bought for $201,600. For the second Bonhams auction of the weekend, an Aston Martin DB5 Convertible was the top result – a similar car was the top result at the Aston Martin Sale in England a day earlier. The Greenwich auction catalog cover car, the stunning American-delivered 1965 Aston Martin DB5 Convertible, sold to a private US collector post-block for $1.45-million, accompanied by the 1959 Mercedes-Benz 300 SL Roadster that was bought for $895,000. Other highlights included the 2006 Ford GT Heritage Edition that made $412,000 and the project work “lost” Cunningham 1954 C3 Coupe that achieved $313,000.